Fed Ex trucks, Ubers and people idling in bike lanes are a common irritant. To these drivers, it’s just a few moments of inconvenience that actually puts the lives of cyclists in peril. At least in these cases, I can ever so politely tell the person behind the wheel that their presence isn’t appreciated. 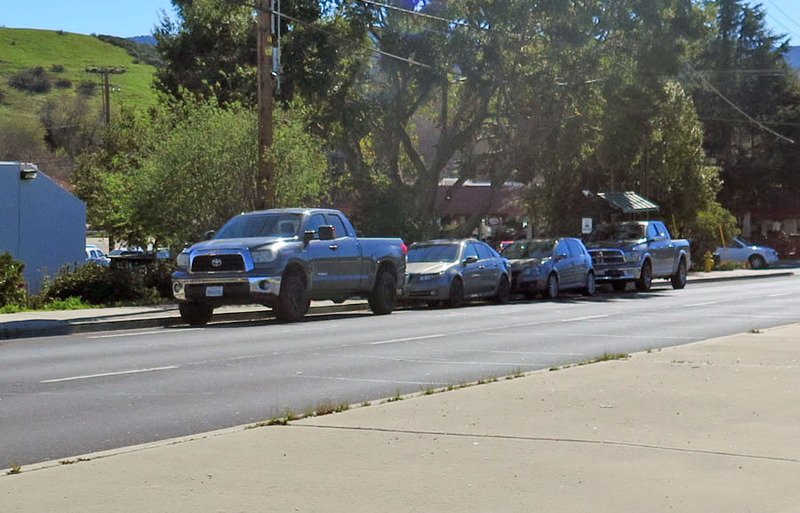 This past weekend, I witnessed not just one, but two places where this personal interaction couldn’t take place because the cars were just parked there. Yes, the plural form was intentional (see top). Solvang is a place that attracts a lot of cycling tourism, so you would like to think of the place as being bike friendly. 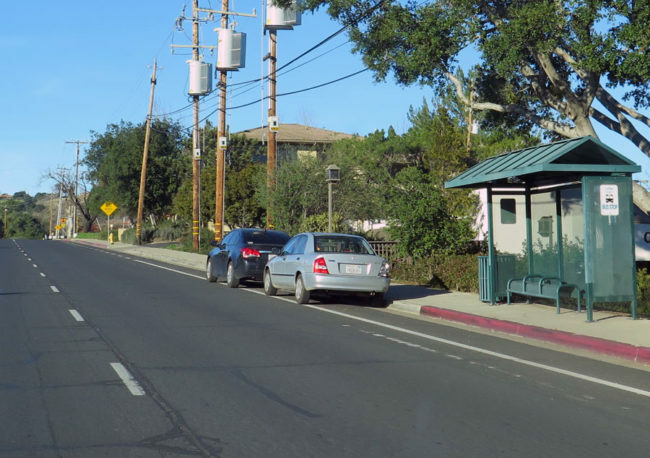 On Sunday afternoon, we were headed up to Los Olivos for dinner when we turned onto Alamo Pintado seeing two cars parked in the bike lane. Mrs. CV caught this and handily took out my camera and snapped some pics as we went by. We were wondering if there was something we missed, but on the drive back, the number of cars tripled and there was no signage suggesting there was an exception in place. Even the next morning as we went by, there were still cars resting there and no parking ticket to be seen. I know as a cyclist, being put into poorly defined spaces confuses everyone involved and raises the level of danger. The one detail I love is the concrete median seen in the picture above. Why is it there? To prevent drivers from making a u-turn to park in the bike lane? On the drive back home on Monday, Google Maps suggested taking Hwy 126, a longer route that avoided the traffic on the 101. Right around Santa Paula CV Jr. woke up in a non-jubilant manner and we had to pull over to get her some fluids. After stopping at Planet Starbucks, I decided to take a slight detour back to the highway to look at the downtown area (I’m a sucker for California history). Taking Palm Ave. to Main St., I was pretty confused at what I saw. The street had bike lane markings on the right and was clearly a place not to mix modes. Instead, every available place a car could park was occupied with a vehicle. 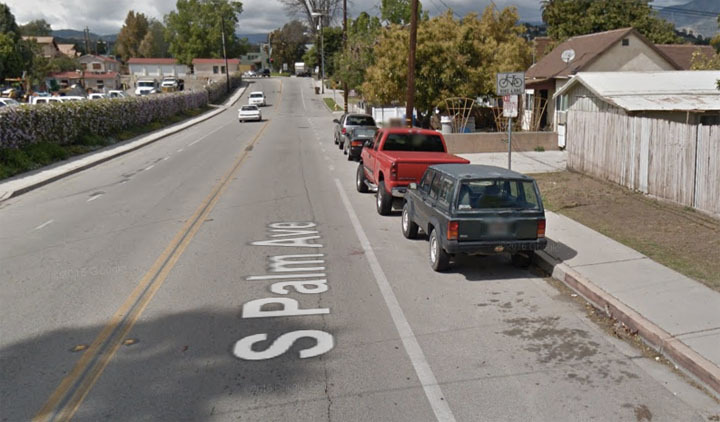 I’m sure someone would make an argument there was enough space for a bike to go by, but cyclists would be stuck dead center of the door zone with no room to react to the left unless they wanted to be underneath a passing vehicle. In this instance, Mrs. CV wasn’t able to grab a camera fast enough, but looking up on the old Google Maps told me all I needed to know. It’s one thing when a single car is parked in a bike lane. The driver is clearly liable, but who do you blame when there’s a complete lack of enforcement? You hate to need an incident for authorities to actually do something about this, but it’s time locals let their representatives know this is intolerable. Adding bike lanes and showing up for the photo ops is one thing, but following through that the safety features in place is another.